A visit to the Whitsundays is a feast of the senses, surrounded by natural beauty, dotted with secluded beaches and friendly towns from which to explore. Explore this incredible diversity from the bow of a sail boat, cruise through the islands and drop anchor for a quick snorkel and wake up to a sunrise over world famous Whitehaven Beach. There are no direct flights from the UK to the Whitsunday Islands, however there are a few of options if you want to fly or travel by road. You can get a flight into one of the airports nearby such as Cairns, Townsville or Mackay and then either continue on by road or fly into Proserpine which is approxminately 25 minutes from Airlie Beach and catch a bus or taxi transfer. Hamilton Island also has an airport and can be reached via flights from Melbourne, Brisbane, Sydney or Cairns and its possible to catch a ferry or boat transfer to some of the other Whitsunday Islands. The Whitsunday Islands are a group of 74 islands that lie off the coast of Queensland and form part of the infamous Great Barrier Reef. Another popular stop off on the Eastern Australia travellers route. The main attraction here is the clear blue waters, the beautiful plethora of islands, exquisite scenery and the warm sunshine – what better way to explore and soak up all of these than by boat. Those that enjoy sailing will be pleased to know that there are a number of companies that charter, offer private hire and even embark on 3 day tours of the islands including the magical Whitehaven Beach – the latter is more suited to backpackers. There are also a number of options to dive in the stunning clear waters of the Whitsunday Islands, many yachts also offer boat dives during their island hopping adventures. On the mainland Airlie is the hub of Whitsundays, and is more or less one long street with bars, shops and accommodation on one side and clear blue ocean on the other. Unlike Cairns, there is a beach but there is also a fresh water lagoon to passthe time while waiting for your boat to sail. Directflights.com can help you find cheap flights to the Whitsunday Islands, Australia. Just use our flight search box and click to search for the cheapest flights and best value low cost flights. Whether you're booking in advance or looking for lastminute flights, we have hundreds of competitive airfares at your fingertips. The weather on the Whitsunday Islands is sub tropical which makes it perfect for beach side holidays. 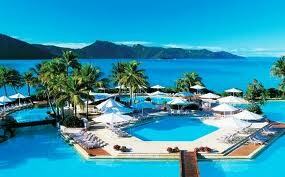 The Whitsunday Islands have a year round warm tropical climate with an average temperature of 27.4 C (81°F). The maximum summer temperatures (December, January and February) are around 30 C and this is also when the highest rainfall is recorded, in the form of tropical showers which are typically brief. The maximum winter temperatures (June, July and August) are around 24-25C. The high average temperatures makes the Whitsundays weather perfect for beach side holidays and suitable year round for swimming, waters sports and exploring the Great Barrier Reef. 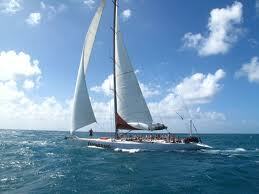 The Whitsundays tropical climate means the days are warm and the atmosphere is very relaxed. The perfect weather for unforgettable tropical holidays.